Having a teenager is without a doubt a daily exercise in patience. My little girl who used to be so sweet and kind just turned thirteen. When it came time to redecorate her room I was not looking forward to it. Trying to please a picky teenager is pretty much LAST on my list of fun things to do. Going out on a limb, I decided to give her room an update while she was away at school. I only had a few hours so I had to choose things I could do quickly and would make the biggest impact. One of the things my daughter loves is horses. 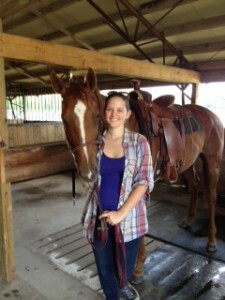 In fact, we both have always enjoyed horseback riding together. Her walls are painted a light turquoise. The color is pretty, but needed something special to make it stand out. I found a gorgeous horse themed wall border from CDK Kids. It features several majestic horses splashing in a river. The water was a perfect accent to our existing wall color. It was super easy to apply and saved me from having to repaint. Instead of placing it in the traditional top or middle spot on the wall, I positioned it about one-third of the way down from the ceiling. It was almost at eye level and really added a special zing to the room. Next, I found horse wallies. These are wallpaper cutouts you can use instead of stencils. I tried stenciling once and let’s just say it was not for me. I used the wallies to decorate her existing lampshade and even placed them on the side of her dresser and nightstand. It looked great and gave the effect that she had gotten new furniture. Finally, I found a new bedding set from Kids Bedding and Linens. I bought the comforter, sheets and pillows from one store and had it all delivered. I lucked out and found a set that was also 30% off. Not having to drive to the store AND saving money (what could be better?). It took me less than an hour to transform my daughters walls, furniture and bedding into an entirely new room. I did it without painting, selling a kidney to fund the project or leaving the comfort of my home. When my daughter came home from school, she walked into her room unaware of the transformation. The excited squeal I heard reminded me very much of the little girl I gave birth to thirteen years ago. She came downstairs and gave me a big long hug. She even said thank you and I think she meant it. That in itself was well worth my effort.